Adv. Mark Arnold, Bil’in’s Canadian Legal Counsel will speak via video conference from Toronto about the case, its precedent-setting significance, and the recently submitted appeal. Adv. Michael Sfard, Bil’in’s Israeli attorney will speak about the village’s cases in the Israeli court system, and the decision to pursue the course of universal jurisdiction. First, I would like to thank you for coming here today, even though I myself am barred from being here because of the Israeli policy of closure. 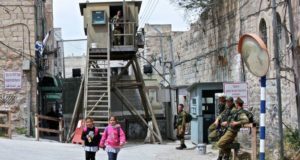 Recently, following the Goldstone report, there has been a lot of talk around Israel’s refusal or inability to adhere to, and implement international law, and the resulting impunity. For me, this is not an abstract matter. In February of 2005, Israel began building its so called separation wall on my village’s lands. Israel has done so despite the International Court of Justice’s advisory opinion the previous year deeming the wall – in its entirety – illegal. My village has exhausted every option we could possibly come up with in fighting this unjust evil. Together with our Israeli and international partners, we have launched an ongoing campaign of civic resistance, for which we have paid dearly: dozens were and are jailed – I myself saw the inside of a prison cell. Hundreds were injured, and one, my friend Bassem Abu Rahmah was killed. He was killed for nothing more than demonstrating peacefully. In our search for justice we have also turned to the Israeli High Court, which despite refusing to take on the issue of settlements, was willing to take on the issue of the wall. In its ruling, the court has pronounced the path of the wall on our land illegal, and pointed to the fact that it was planned to allow the expansion of the neighboring settlement, Modi’in Illit. It had also ordered the rerouting of this wall in a less harmful way, that will return *some* of our lands back. It has been two years now since this ruling, and even this very partial change, had not yet materialized. The wall remains on our land, in its original path. Meanwhile, the settlement behind this wall continues to grow, in clear Israeli contempt of international law. Obama or no Obama the construction of 84 new residential units was approved just last month by Ehud Bark, the Israeli minister of defense. In turning abroad, to the Canadian court today, and to others in the future, we hope to find a way to breach Israeli impunity; to find a way to realize justice and our rights. It is a way for us to sustain our belief in civic and grassroots action, and hope that our sacrifices have not been in vain. Al-Haq is disappointed that its representatives could not be here to join you in this press conference due to the policies of the Israeli occupation. While these policies impact us on a daily basis, we will never accept them, as the people of Bil’in will never accept the theft of their land. Al-Haq is privileged to have the chance to fight for justice alongside the resilient villagers of Bil’in and the brave legal team of Mr. Sfard and Mr. Arnold. 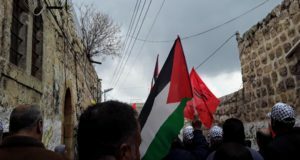 As long as we continue to pursue justice there will be hope for Bil’in, as well as all Palestinians struggling for their right to self-determination. This case is another example of that pursuit for justice. We are confident in the appeal, as it is clear that the Israeli judicial system cannot serve as the forum for achieving justice for Palestinians. We stand ready to raise the issue of corporate accountability and work with lawyers anywhere in the world to hold corporations accountable for their complicity in the policies of the Israeli occupation and the breaches of international humanitarian law in the occupied Palestinian territory.